What do you get when you combine yummy homemade cookies, conversation with girl friends, hot tea under the light of a Christmas tree and the warmth of a crackling, REAL WOOD burning fire? I'll tell you what you get. You get a perfectly relaxing and blissful evening. And, at the risk of bragging, you get a picture of how I spent last night. If it all sounds like a Hallmark card to you, I have to tell you IT WAS in the very, very best way imaginable. A week or two ago, I received an invitation to my FIRST EVER cookie exchange. I've heard tell of these mythical get-togethers, but have never actually seen one up close and in person! I warned my hostess that since I have only recently become semi-domesticated, I wasn't promising a tasty contribution to the evening, and I wasn't sure of all of the rules of participation. But I explained that I could eat the crap out of some cookies and would gladly stumble my way through if it meant I got to bring home a whole slew of homemade treats! The stakes were raised when one of the "exchangers" called to tell me about the success of her cookies. In fact, her words might have been along the lines of you, "You better bring it, because the peanut butter cookies that I made are redunculous." The gauntlet was thrown! So, you may be asking , did I meet the challenge? What on earth did I contribute to the evening ~ besides my charm and sense of humor? My initial plan was to share coffee toffee (which sounded like it might be a bit out of my league) and also make gooey butter cookies as a back up in case of utter toffee failure. I'm happy to admit that my first string attempt was a success. (Whew! I was able to tell the peanut butter cookie challenger that "It had already been brought-en." Complete with a wagging neck.) And though the "back up" cookies weren't needed, they came along for the ride. I ripped the toffee recipe right off a darling blog called Smitten Kitchen. I'm telling you, this coffee toffee is delicious, delectable and totally doable. 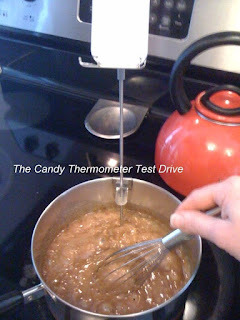 AND, I finally got to use the candy thermometer that we registered for 3+ years ago. (seriously, I didn't even know what the thing was when I registered for it, but boy am I happy we added it now!!!) The gooey butter cookies were (are) totally delish too. That recipe couldn't get any easier if it tried. And the cookies turned out super moist, cakey and mmm mmm good. All in all, the evening itself was a smashing success. The cookies were yummy (and they may be around for a few more days... though I can't promise anything since the handsome hubby is back in town), the company was divine and the atmosphere was just what a girl needs at the end of the work week and smack dab in the middle of the hustle and bustle of the Christmas season. Cozy. Comfortable. Relaxing. Delightful. Yay for cookies. Yay for cozy evenings with friends. And Super Yay for Christmas in one week.